A masked man robbed a Pacific Beach gas station at sunrise Sunday. 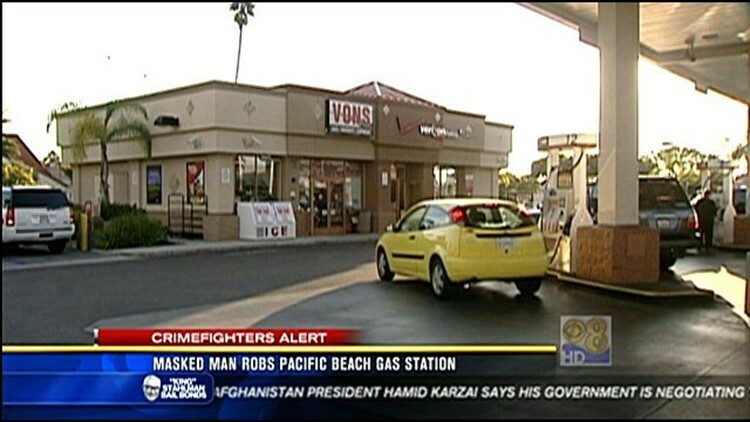 SAN DIEGO (CNS) - A masked man robbed a Pacific Beach gas station at sunrise Sunday. The incident occurred at the Vons gas station on Garnet Avenue and Jewell Street at 6:29 a.m., San Diego Police Officer Frank Cali said. The suspect, said to be in his 20s, walked around the counter towards the clerk and demanded cash. He fled east on Garnet Avenue with an undisclosed amount of money, Cali said. The robber did not indicate that he had a weapon and nobody was injured. He was described as 5 feet-6 inches tall, 150 pounds, wearing a dark colored hooded sweatshirt, a ski mask and blue jeans.